If you’re a user of in-ears, you may be interested to know that you could be getting more out of your purchase. It’s very possible that you’re not getting the right fit, and that can have consequences like poorer sound quality, worse isolation, and discomfort. While we can’t give you scientific measurements of how uncomfortable in-ears may be, we can show you how a bad fit can affect your listening—and why you should put the time in to get the best fit possible. Editor’s note: this article was updated to include an explanatory video. If you’re new to higher-end in-ears or even just want to get more out of your existing in-ears, a good seal is the single most important thing you can do to make your music sound better. 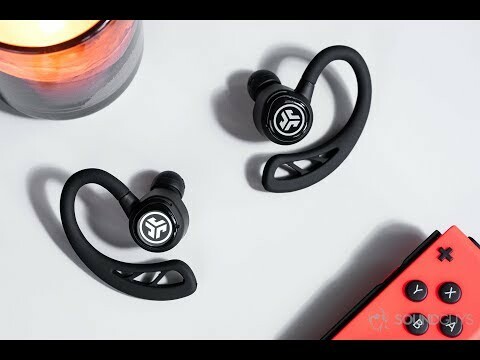 Not only will the earbuds perform the way they’re meant to, but a good seal will block out more outside noise, meaning you don’t have to turn up your tunes as much. That, in turn, means you can avoid noise-induced hearing loss. Additionally, a good fit means that when you work out, walk around, or otherwise move: the in-ears won’t fall out for no reason. It seems like a no-brainer, but the advantages of a proper fit are huge—especially if you want to use true wireless earbuds. Because a good fit is something we can test, we’re going to do exactly that. Today we’re simply going to use the same set of earbuds in our test fixture to see how each size affects the sound and isolation. There are eight pairs of ear tips included with the JLab Epic Air Elite, so we’ll roll with that for now. We’ll use our normal testing protocols for each set of sleeves, and note how you’d experience the results in concrete terms, like how it’d affect your music. Today’s victims of Chris’ tinkering. To perform each test, we’ll use the same test fixture so that all our results are directly comparable. Our fixture uses human-like ears, but because everybody’s ear canals are different, your experience will probably be different in minor ways. We’ve done something similar before when discussing headphone “burn-in,” but in-ears don’t have viscoelastic foam that degrades over time to change how you hear the sound. We found that the ear canals on our test fixtures were quite shallow, which is a common issue with some in-ear users. The fact of the matter is that all of our ears are vastly different from person to person, and ear canal depth is just one of the factors that can make ear tips uncomfortable or ineffective. Though we’d normally assume that double or triple-flanged tips will isolate better, for the wrong ear canal that’s not always true. We also noted that the testing results varied wildly, and which tips you use can have a huge impact on your listening experience. In general, you can tell if you have a decent fit a number of ways, but today we’re just looking at isolation and frequency response. The better the fit, the more isolation you’ll see, and the more regular the frequency response. Large tips (blue), medium tips (red), and small tips (green) shown here. Right off the bat, it looks like all of our ear tips fit the test fixture fairly well. Great! Here we see a lot of high-end isolation (below) like you’d expect from a good seal, and the frequency responses are roughly similar. However, as similar as they look, the sound will be quite different based on the ear tip. The large ear tips (blue) will have music that sounds clearer than the others, and the medium tips (red) will give you far bassier music. JLab offers a lot of ear tips with its models, so it made for a good guinea pig. I’d say that the large ear tips are the best fit, because they most consistently block out noise at lower notes than the others. Even a 3dB reduction here can cut the force on your ears by roughly half, so every little bit counts. Consequently, we can rule out the small tips (green) as “fitting well” here, because it doesn’t block out at much outside noise. A good seal will provide more consistent isolation. However, there are more ear tip types here, and those get a little hairier. Remember when I said that our test fixture has shallow ear canals? Well here’s where that starts to show up. The double and triple-flanged tips are longer than the regular silicone ones, and consequently didn’t fit our test fixture as well as we’d hope. However, that does give us the opportunity to see what having ear tips that fit badly do to your sound! Yikes. Though this looks bad (and is, for the most part), it’s not the JLab Epic Air Elite’s fault that this test used the incorrect ear tips. It’s just what happens when you get a bad seal. A good fit can make or break your entire listening experience. The double-flanged tips on this pair of RHA earbuds attempt to seal your ear canal twice. On the above chart, you can see the bass (pink) drops significantly, and the higher notes and sounds in your music (green, blue) will sound roughly twice as loud as anything else. Your music will sound very different from the first tips we tried, and you may not like it. Music with a response like that will probably sound unclear, and a little harsh when the cymbals, snare drums, and synths hit. You won’t be able to hear basslines as well as you should either, with lower notes and male vocals getting drowned out by higher notes. Take Olivia Noelle’s High for Me for example. The bassline and marimba combine to set the stage for the whole song, as the vocals and background samples are in a higher key. However, with a note emphasis like the one we just recorded, you’ll have a lot of trouble hearing anything but the singer, drum machine, and some of the samples. With the single-flange tips we tested above, you’ll hear everything I just mentioned, and enjoy the song quite a bit more. Double-flange tips make two seals in your ear to provide extra isolation. Even if the fit isn’t perfect, they typically isolate better than normal silicone sleeves. However, the improvement here isn’t as big as it should because of the poor fit in our test ears. It seems that the tips are unable to make the correct seal because the ear canal is so short. For these ears, the double-flange tips aren’t a good option. We saw similar results with the triple-flanged tips, so we didn’t see the need to rehash that here when the headline is: those tips didn’t fit our fixture. Seems a little too straightforward, right? It’s not a complicated issue, but it really does make a difference. So take the time to experiment with your new in-ears. I promise you it’s worth it. If you’re not satisfied with your fit, you may also be able to use third-party options to get an even better seal. However, we always like to see consumer products with many options to meet the needs of their intended users.